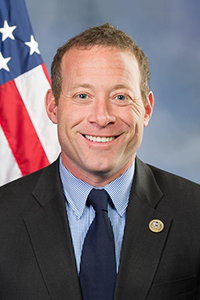 First elected in 2016, Congressman Josh Gottheimer represents New Jersey's Fifth Congressional District in the northernmost part of the state. A graduate of the University of Pennsylvania, he later went on to become a Thouron Fellow at Oxford, and then paid his way through Harvard Law School. In Congress, he serves on the House Financial Services Committee where he works on three subcommittees: the Capital Markets, Securities, and Investments Subcommittee, the Oversight and Investigation Subcommittee, and the Terrorism and Illicit Finance Subcommittee. Elected as Co-Chair of the bipartisan Problem Solvers Caucus in 2017, Congressman Gottheimer works to bring the group of 24 Democrats and 24 Republicans together to find areas of agreement on key issues including lowering taxes, cutting burdensome and unnecessary regulation, lowering health insurance premiums, and improving infrastructure to help the American people. For his support for pro-growth policies in Congress, the U.S. Chamber of Commerce awarded Congressman Gottheimer its Spirit of Enterprise Award and was recognized as the most bipartisan Democratic freshman Member of Congress by the Lugar Center and the McCourt School of Public Policy at Georgetown University. Congressman Steve Watkins is a 6th generation Kansan, growing up down the street from the State Capitol in Topeka. His father served in the Air Force and has been a well-respected physician for nearly 40 years. His mother is a retired public school teacher. After graduating from Topeka West high school, Steve went on to get an engineering degree from West Point and master’s degrees from both MIT and Harvard. Congressman Watkins is an Iditarod racer, a Mt. Everest climber, and a combat veteran who served in Afghanistan in 2004. Steve Watkins’ life and career have been characterized by integrity, courage, leadership, and selfless service. While the uniform may be changing, the values and convictions are not. A group of informal “get to know you” meetings organized for members of both parties in early 2017 quickly grew into more substantive cooperation across the aisle and the Caucus aligning behind several bipartisan proposals. The Problems Solvers are now a caucus of equal numbers of Republicans and Democrats. Join NAAPAC and NSC for a free reception to network with other NAA members all while raising funds for NAAPAC to advance the industry’s policy objectives before a new Congress. The entry for NAAPAC Sweepstakes is now closed. The winner will be announced after Advocate. Contact Sheryl Eastman, Manager of Political Action Committee.